This section launched: 28 December 2005. Last updated: 25 December 2006. 081 - Roald Amundsen, a Cessna turboprop aircraft. 243 - Roald Amundsen, Norwegian air shuttle. Stars & Stripes, Richard E. Byrd's aircraft. Virginia Aviation Museum, Richmond International Airport, 5701 Huntsman Road, Sandston, VA 23150-1946, USA. 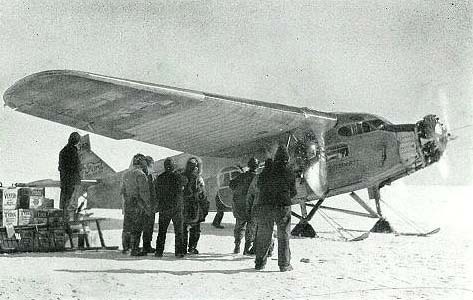 The explanatory plaque reads: "On January 15, 1929, this Fairchild FC-2W2 became the first aircraft to fly over Antarctica. Stars and Stripes was one of a complement of three aircraft Commander Byrd took with him on his first expedition to the bottom of the world. The other aircraft were a Fokker Universal, the Virginia, and the Ford Trimotor Floyd Bennett, which made the famous flight over the South Pole. Among Byrd's achievements aboard the Stars and Stripes was the discovery of the heretofore unknown mountain range which he named after the Rockefellers. There was also the rescue of the Virginia's hapless crew after the Fokker was destroyed on the ground by high winds while out on a survey mission. The Stars and Stripes provided stalwart service throughout this expedition and the 1934 expedition setting out caches of fuel, food [and] equipment as well as flying scientific survey missions. When Stars and Stripes was shipped back to the United States, it had flown a total of 187 grueling Antarctic hours. The aircraft was subsequently used by different owners as a barnstorming ship, a crop duster, [a] photoship and hangar queen. Fairchild eventually took ownership again and in 1962 donated Stars and Stripes to the Smithsonian. Stars and Stripes is a loan of the National Air & Space Museum in recognition of this museum's location on what used to be known as the Richard Evelyn Byrd Flying Field." Polar Star, Lincoln Ellsworth's aircraft. National Air & Space Museum, Independence Ave at 4th Street, SW Washington, DC 20560, USA. In Gallery 105 of the Smithsonian's National Air and Space Museum in Washington you'll find on display Lincoln Ellsworth's Polar Star, a Northrup 2B Gamma single engine airplane that in November, 1935, Ellsworth and Herbert Hollick-Kenyon flew 2,300 miles in six stages from Dundee Island in the Weddell Sea to Little America II . . . or nearly. They ran out of fuel 16 miles short of their goal. Abandoning the Polar Star, they sledged to Little America, arriving at the then-vacant station on December 15, 1935. Thankfully, Ellsworth's ship, the Wyatt Earp, arrived on January 22, 1936 to rescue them. The exhibit includes a couple of penguins, a mural backdrop and a case containing Bernt Balchen's flying helmet and goggles. For a bit more information go to the NASM web site. Roald Amundsen, a Cessna turboprop aircraft. One would think this aircraft still exists somewhere. "Thor Tjøntveit was a Norwegian-born naturalized US citizen and a pilot for Wien Airlines in Alaska, and Einar Pedersen was a Norwegian and a navigator with SAS. Their venture was a "pole to pole" flight home to Norway after finishing second in the London-Sydney air race. Their Cessna turboprop aircraft, named Roald Amundsen, had been fitted with extra fuel tanks to augment the normal 4000-mile range. On 15 January they received Antarctic landing and clearance from the US program in Washington. They left Invercargill in the evening of 18 January, and after a brief fuel stop at McMurdo they continued on to Pole. Originally they had not planned (or requested) a landing; their intention was to descend to 50' and drop Norwegian and American flags over the geographic Pole. However, they landed at Pole on the 19th, the same day as Max Conrad, who had arrived 12 hours earlier . . . Their unplanned arrival caused a bunch of extra work for the station crew, who had to warm them up (below) as well as dig and push them out after the aircraft became stuck in the soft snow . . . They left Pole about 5 hours later, returning to McMurdo. They stayed there for 3 days before leaving for Punta Arenas on the afternoon of 23 January —a 19-1/2 hour flight. Their final destination was Norway." 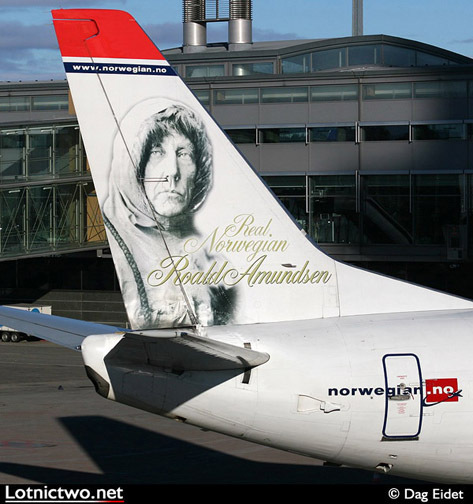 Roald Amundsen, Norwegian air shuttle. You might see this Boeing 737-36N some day in Norway. 45 Harvard Avenue, Main South Road, Christchurch, NZ. "The Air Force Museum brings together a collection of historic aircraft, including original Beaver and Auster aircraft used in early Antarctic aviation." "There are supporting exhibits associated with the depot laying in 1957-58, for the Commonwealth Trans-antarctic Expedition 1955-58." Manufactured by Auster Aircraft Ltd at Rearsby in November 1950 as a dual contol airtrainer, going to the RAF in 1950. It served with the RAF until 1955 (possibly in the Middle East) before being returned to the factory for modifications. In November 1955 it was allocated to the Trans Antarctic Expedition along with Auster WE600. WE563 was purchased from the UK Air Ministry at a cost of £8696-17-3 for the use of the NZ Antarctic Expedition. It arrived in Lyttleton, via the SS Rangitikei, on 28 May 1956. The aircraft was left in the livery it arrived in, except for the addition of "NZ1707" on the rear fuselage. 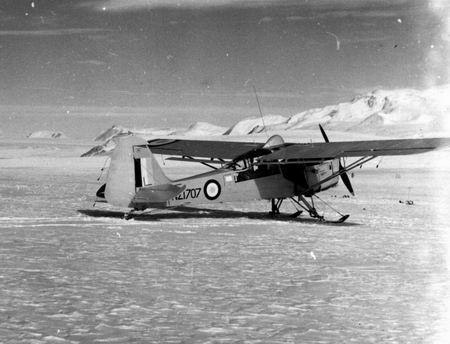 During cold weather training for the Expedition in 1956, the aircraft was damaged while landing on the Tasman Glacier. It had to be hurriedly repaired before travelling to the Antarctic with the expedition for the summer season. The aircraft had two tours of duty on the ice, the first from December 1956 - March 1958, and then from December 1959 - March 1961. After returning to Wigram the aircraft was overhauled and put into service as a trainer. It served at Hobsonville as part of an Army unit in 1963. In 1965 it was transferred to No 3 Battlefield Support Squadron and in August 1966 it crashed into Kaipara Harbour and was written off. Eventually disposed of to the Museum of Transport and Technology in Auckland, NZ 1707 was later returned to Wigram. The aircraft is displayed in the livery it was in at the time of the Tasman Glacier accident. Manufactured in 1957 and registered to Aerial Agriculture Ltd, Sydney as VH-AAL. It was brought to New Zealand by Air Contracts Limited Masterton in September 1965 and registered as ZK-CMW. Sold to Fieldair Ltd Gisborne in February 1969 and transferred to Fieldair Holdings (Central) Ltd, Palmerston North in November 1980 it was used for aerial topdressing. The aircraft was acquired by the Museum in 1985. The aircraft is displayed as NZ6001 "City of Auckland". This aircraft was one of two Antarctic aircraft serving on the ice from 1956 with the Trans-Antarctic Expedition and was lost in an accident on the Beardmore Glacier in January 1960. In 1959 the aircraft was re-serialled NZ6010 when it was realised that NZ6001 was the number allocated to the Gloster Meteor." The Auster on the left; the Beaver on the right. Ferrymead Park Drive, Christchurch, NZ. Ferrymead Heritage Park contains a huge collection of working machines, including a DC3 plane used for US Antarctic supply missions in the 1960s. This has been restored by the Aeronautical Society. This is probably the same aircraft described elsewhere: "R4D Dakota aircraft used in Antarctica, gifted to city by United States Navy, 18 April 1959." Que Sera Sera, first aircraft to land at South Pole. National Museum of Naval Aviation, Naval Air Station, Pensacola, FL 32509, USA. 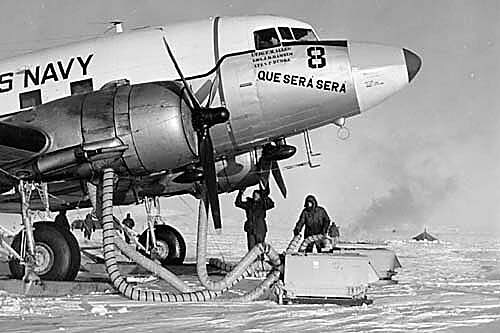 On October 31, 1956, an R4D (named Que Sera Sera) piloted by LCDR Gus Shinn and under the command of RADM George Dufek landed on the ice at the South Pole to become the first expedition to stand at that spot since Captain Scott of the Royal Navy reached it in 1912. The Museum's R4D-5L aircraft (BuNo 12418) is the famous Que Sera Sera on loan from the Smithsonian Museum. They flew 800 miles from McMurdo Station on the Antarctic coast to the South Pole on Oct. 31, 1956 in an aging R4D, affectionately and sometimes derisively called a "Gooney Bird." It was the Navy version of the piston-powered, twin engine DC-3 airliner that had gone into service 20 years earlier. 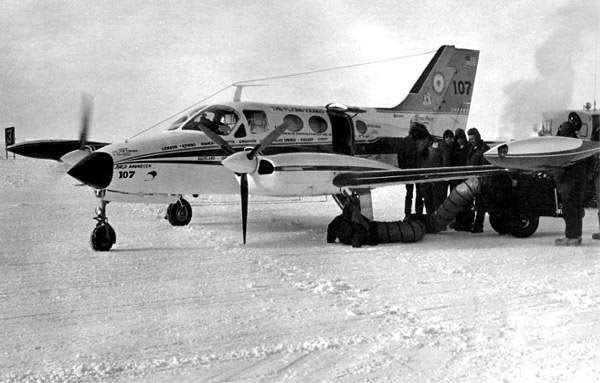 The R4D had none of the sophisticated navigation gear nor the power of the turboprop LC130 Hercules the New York Air National Guard used to pick-up Dr. Jerri Nielsen from a research station at the South Pole last month. Shinn, originally from Eden, NC was one of seven Navy men aboard the R4D, including Rear Adm. George Dufek. The 77-year-old Shinn, now living in Pensacola, recalled his flight in an interview at the Museum of Naval Aviation where the plane is on display. It was named Que Sera Sera - French for whatever will be will be - the title of a then-popular song. The name turned out to be very appropriate, Shinn said. Just as the Air Guard did this year, the Navy waited for winter to wane before attempting a polar landing, although not long enough for Shinn. The Cold War had literal meaning in the Antarctic. Dufek was in a hurry, worried that the Russians might get there first. An earlier flight in another R4D to seek a refueling site between McMurdo Station and the pole nearly ended in disaster. Flying into a valley, the plane got caught in a windshear and began falling. Fortunately it was equipped with small rockets called JATO for jet-assisted take-off. Shinn fired all 11 JATO bottles to stop the fall just as the wing tip hit the ice. There was "lots of noise, lots of fuss" but damage was minor and the plane flew fine. Dufek did not want to go to the pole with a bent wing so they borrowed Que Sera Sera from another crew. The polar landing was a bit rough, but not unusual for the terrain, recalled Strider, 69, from his home in Newport News, Virginia. Strider is the only other surviving member of the landing party. Their JATO assisted takeoff appeared uneventful to those watching from an Air Force C- 124 Globernaster that circled overhead. It was not. The high altitude of the ice cap--about 10,000 feet at the pole--starved engines of oxygen and robbed wings of their lift. That, along with the plane's 28,000-pound weight, made JATO necessary to take off in the best situation. The JATO bottles usually were fired after the plane hit 30 knots, but Que Sera Sera remained stuck with the engines at full power. "We just sat on the ice like an old mud hen," Shinn said. To break loose, Shinn fired four JATO bottles. That did the trick, but he was worried about having enough JATO left to get airborne. They barely made it only to be enveloped in ice and snow. We couldn't see anything, but that was no big deal," Shinn said. He relied on instruments to keep flying. Source: Pp3-4, The Antarctican Society Newsletter Vol 99-00, No 3 December 1999. 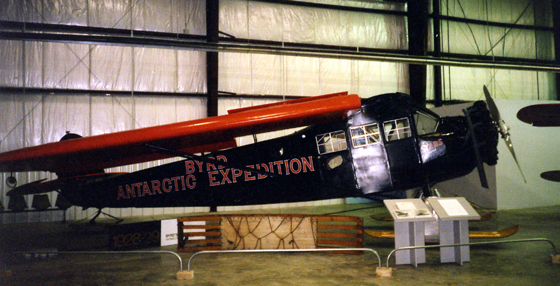 Floyd Bennett, Richard E. Byrd's aircraft. Henry Ford Museum & Greenfield Village, 20900 Oakwood Boulevard, P.O. Box 1970, Dearborn, MI 48121-1970 USA. Admiral Richard E. Byrd made the world's first flight over the South Pole in this all-metal Ford Trimotor aircraft in November 28-29, 1929. From 1925 to 1932, Ford built 196 Trimotors, the first commercially-successful all-metal aircraft, and opened a new era in commerical aviation. National Museum of the USAF. As far as I can tell the only Antarctic related aircraft in the collection is a Douglas C-124C Globemaster. "The C-124 evolved from the earlier Douglas C-74. To facilitate cargo handling, the C-124, or "Old Shakey" as it was affectionately known, featured "clamshell" loading doors and hydraulic ramps in the nose and an elevator under the aft fuselage. It was capable of handling such bulky cargo as tanks, field guns, bull dozers and trucks. It could also be converted into a transport capable of carrying 200 fully-equipped soldiers in its double-decked cabin or 127 litter patients and their attendants. The first flight by a C-124 took place on Nov. 27, 1949, and deliveries of C-124As began in May 1950. 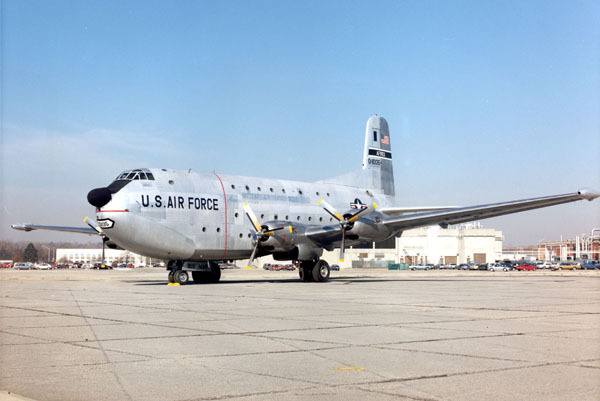 The USAF bought 448 C-124s before production ended in 1955. These planes performed such missions as airlift support in the Far East and Southeast Asia, resupply missions to Antarctica, refugee evacuation in the Congo and mercy flights to Morocco, Chile and elsewhere throughout the world following floods and other natural disasters. Most C-124s were transferred to the Air Force Reserve and the Air National Guard by 1970 and all were released from active service in mid-1974. The aircraft on display was assigned to the 165th Tactical Airlift group of the Georgia Air National Guard following its service with the USAF. It was flown to the museum in August 1975. It is marked as a C-124 assigned to the 909th Military Airlift group making supply runs to Southeast Asia in the late 1960s and early 1970s. Span: 174 ft. 1 in. Height: 48 ft. 4 in. There is a non-flying Shackleton aircraft at Duxford although there is little about it on the museum's website. Single otter aircraft, De Haviland Aircraft Heritage Centre. Salisbury Hall, London Colney, Hertfordshire AL2 1EX, UK. 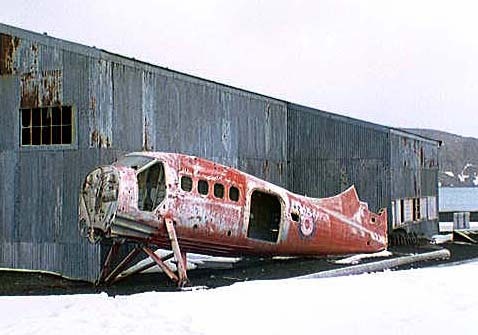 "Wreck of the DHC-3 Single Otter (VP-FAK) at Deception Island was removed to Rothera. BAS hopes to ship it to the UK next season to the De Haviland Aircraft Heritage Centre where it will become the central exhibit in a new Antarctic aviation display." Listed on the Centre's website is: "VP-FAK, DHC3 Otter	, British Antarctic Survey loan & restoration." The aircraft when at Deception Island sometime in 1998. Quonset Point, 488 Eccleston Avenue, North Kingstown, RI 02852 USA. "Founded in 1992 with the assistance of then Governor Bruce Sundlun, the air museum educates the public in the state's rich aviation legacy and displays collections that document the contributions of Rhode Island to the growth and development of aviation and space exploration. QAM is housed on 3 acres in an original Naval Air Station Quonset Point hangar built in 1945. The museum has a large and valuable collection of aircraft, aircraft parts, and other historical artifacts. The 28 aircraft currently on display or under restoration include civilian, military and prototype aircraft dating from 1944 (Hellcat under restoration) to 1983 (F-14 Tomcat)." "The birthplace of the US Navy, Quonset Point goes back to the Revolutionary War, when a guard was placed there to watch for British warships that might sail up Narragansett Bay to raid coastal Rhode Island cities. By the late 19th Century, Quonset Point had become the State Camp Ground for the Rhode Island Militia and, later, the Rhode Island National Guard. During the Spanish American War, the conflict in Mexico and World War I, troops trained at Quonset Point. On June 7, 1938, a Naval Board headed by Rear Admiral Hepburn was authorized by Congress to study the need for, and location of new bases on the East Coast. Quonset Point was selected and in May 1940, $24,204,000 was asked of Congress by the Navy to finance the project. Construction was begun on 16 July 1940 upon a tract of land of approximately 996 acres (including Hope Island) to which was added an area, made by hydraulic fill, of approximately 260 acres, making a total of 1,256 acres. Subsequent to the deactivation of the former Naval Construction Training Center (Seabees) at Davisville, a total of 492 acres was transferred from that activity to the Naval Air Station (NAS), making the present area of the station 1,748 acres. During World War II, NAS Quonset Point served on the front lines of the war against the U-boats. Numerous land-based and carrier-based anti-submarine squadrons trained and shipped out from Quonset and these accounted for many U-boats sunk and many merchant ships saved. During the war, the base was also on the cutting edge of research in airborne radar and electronics systems. NAS Quonset Point was home not only to U.S. pilots but to those of Allied nations as well. Many British and Canadian pilots trained at Quonset and 12 carrier-based squadrons were born there. After the war, NAS Quonset Point continued its anti-submarine work, this time in the cat-and-mouse game with Soviet submarines in the North Atlantic. It was also one of the primary overhaul and maintenance facilities for famous aircraft such as the A-4 Skyhawk, an aircraft that figures prominently in the museum's collection. NAS Quonset Point continued in these and many other roles until the base was closed in 1973. NAS Quonset Point was also the home base for VX/VXE-6, the Navy's Antarctic Support Squadron. Annually from 1956 to 1973, this squadron traveled to Antarctica to support Operation Deep Freeze, the U.S. contribution to the international scientific exploration of Antarctica that continues to this day. NAS Quonset Point has a long and distinguished history. It is the role of the Quonset Air Museum to preserve and make available to future generations this history." A41, Cosford, Shropshire, TF11 8UP, UK. The only aircraft here with Antarctic connectons is probably this Auster. "The Auster is derived from a cabin monoplane originally built under licence from the Taylorcraft Corporation of America. 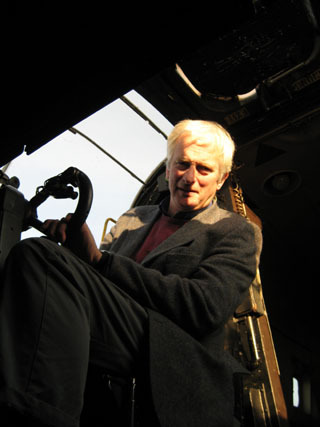 Auster Is and IIs had been successfully used by the RAF for Army co-operation duties during the War. These were superseded by the Auster AOP6 after the War. The T7 was a dual control version of the AOP6, powered by a 15 hp de Havilland Gypsy Major VII engine. 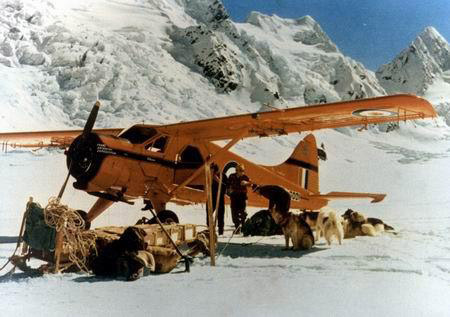 2 Auster T7s (WE 600 and WE 563) were specially modified for Dr Vivian Fuchs' 1955 trans-Antarctic expedition. Modifications included skis (or flats [sic]) in place of main wheels, extra navigation equipment and cold weather gear. After a successful Antarctic expedition, WE 600 took part in a number of displays whilst the other aircraft, WE 563, was transferred to the Royal New Zealand Air Force. WE 600 arrived at the Aerospace Museum in 1989." AFB Swartkop, PO Valhalla, 0137, Republic of South Africa. 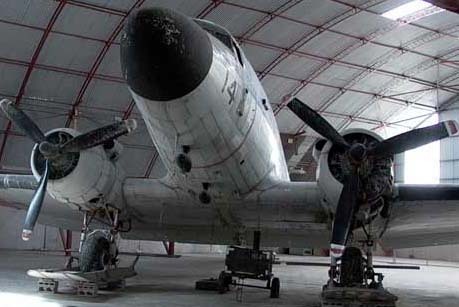 There is a Shackleton aircraft at this air museum in South Africa. 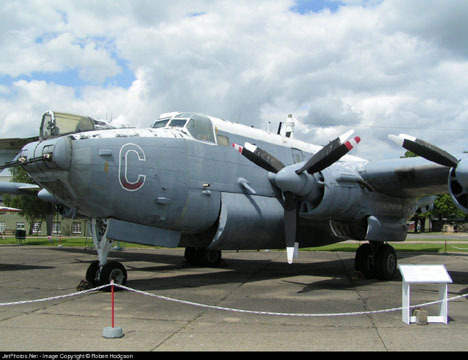 "Avro Shackleton MK3 number 1721 at the SA Air Force Museum at Swartkop recently had a �face-lift� when three dedicated men embarked on her revamp that started on 9 October 2006. Over a four week period Sgt Wayne Alexander, Mr Jan van den Broek (Aero Manpower Group) and Mr Mike Burger (Aero Manpower Group) completed the arduous task of preparing and re-painting the complete Shackleton aircraft. Sgt Alexander and Mr Van Den Broek did the initial preparation and paint work and Mr Burger completed the aircraft with signage and decals. Approximately 17 litres of white paint, 15 litres of Dark Sea Grey paint, 30 litres of Pru Blue paint and more than 100 litres of thinners were used to complete the task. This extraordinary effort by the three dedicated men from 1 Air Servicing Unit (1ASU) is highly commendable. With this in mind the Museum also appreciates the efforts of Brig Gen Karel Ehmke (DTSS) who intervened during this year and who was instrumental in speeding up the process to complete the Shackleton in 2006. Thanks and appreciation also goes to the support given by the Officer Commanding and Personnel of 1 ASU. The SA Air Force Museum is extremely proud to present a shining bright Shackleton on display and similar touch-up and re-paint projects will be done in the immediate future in order to enhance the overall display of museum aircraft. Congratulations on a job well done!" Newark (Notts & Lincs) Air Museum Ltd. The Airfield, Winthorpe, Newark, Nottinghamshire NG24 2NY, US. 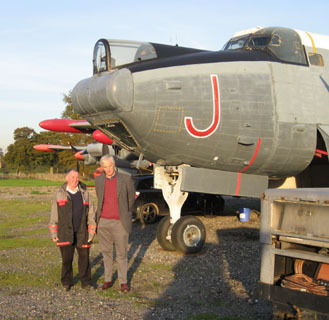 The Museum has a Avro Shackleton MR.3/3, registration: WR977. I had heard that there was a Shackleton aircraft at this air museum in Texas. There's no mention of one on its website.